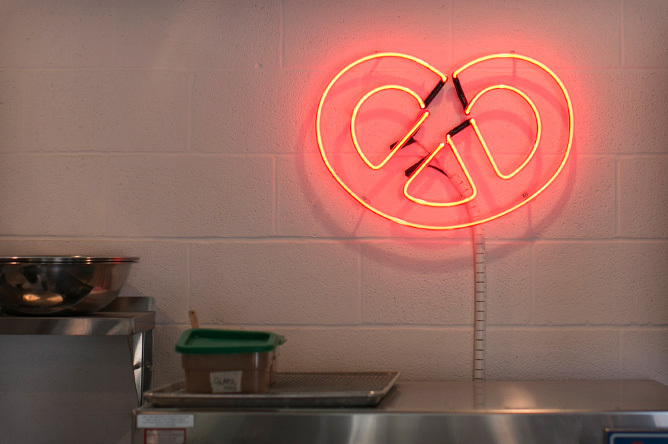 WE BELIEVE IN LIFE, LIBERTY, AND THE PURSUIT OF PRETZELS. Just about every childhood memory I have involves pretzels. It seemed every trip to the store, soccer practice, or vacation started (or ended) with a bag of pretzels. I guess it was the easiest and cheapest way to keep 4 kids happy. Every Saturday morning my family would meet at my grandmother’s house for lunch and tea. My father was a mailman in the neighborhood and he would often come by in his mail jeep and scoop up one of the kids to go on a pretzel run. When it was your turn, you felt like the luckiest kid in the whole world. After all, the steering wheel was on the wrong side and there was no other seat to be found, so you just bounced around on top of piles of mail. Seems a little dangerous looking back, but it was the '80s man. My father knew the neighborhood very well, including where they baked the pretzels that were being distributed all over the city. We would pull up to a dormant warehouse with no signs…or signs of life. There was a nondescript door that required both of us to push with all of our might: it was as if they were TRYING to keep us out! But once that door swung open, it was like Charlie and the Chocolate Factory, only with pretzels! There were huge ovens and conveyor belts and what seemed like an endless supply of pretzels coming from every direction. The smell of fresh baked pretzels was intoxicating. We would grab a couple bags of pretzels right out of the oven, plus a couple of extras we could eat on the way back to my grandmother’s house. Carryingthe pretzels inside meant being tackled by my brother, sisters and cousins…and everyone was happy. These memories drive me each and every day. I feel that if I can create this experience for just one kid or family, all my hard work and sacrifice will be worth it. 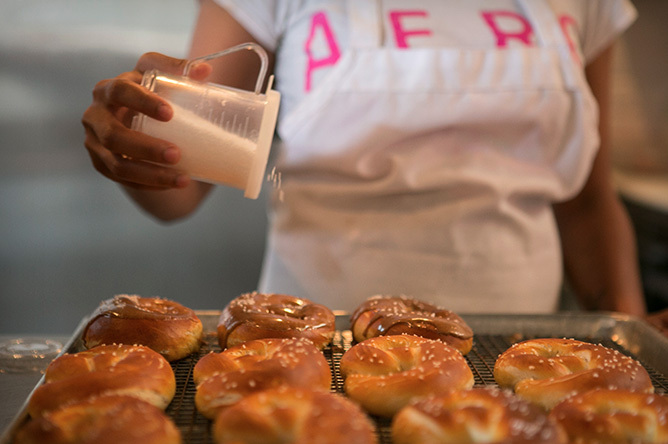 Contact us about serving our pretzels at your bar or restaurant.